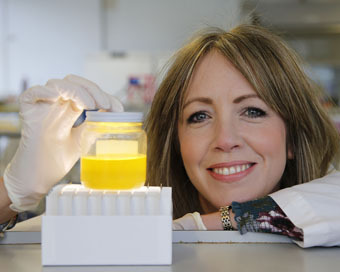 Cancer researchers at University College Dublin (UCD) have led the development of a new test which uses urine to detect prostate cancer. Studies have so far shown the test to be 70% more specific for prostate cancer compared to the blood test currently used by doctors. Pictured at the UCD O’Brien Centre for Science is Dr Antoinette Perry, UCD School of Biology and Environmental Science and UCD Conway Institute. (Image: Nick Bradshaw, Fotonic).